Zeppelin L-13 Naval Airship seen here at Friedrichshafen in 1915. "Apples baked on the trees and roosting wild birds roasted alive"
On the night of Saturday 2nd September 1916, the north Nottinghamshire town of Retford was subject to a raid by Zeppelin L-13 commanded by Kapitanleutnant Prolss. As L-13 followed the well tried route across the North Sea, heading for the steelwoks at Sheffield and Rotherham, bombs were loosed over Retford (in error?) causing damage on the east side of the town, in the Spital Hill and Grove Lane areas. With weather conditions condusive, L-13 was just one of 16 Zeppelins - drawn from both the German Army and Naval services - which set out to bomb Britain that day. Two turned back before reaching the coast, leaving 14 to complete the mission. L-13 croosed the coast near Cleethorpes at about 10.56pm, pursuing a westerly course towards Gainsborough. Before reaching Retford bombs were dropped at Gainsborough, East Stockwith and Morton before reaching Retford at around 12.56am on Sunday 3rd September 1916. "A bomb fell in a field but did not explode. Later it was an object of much interest, half buried in the ground, with its handle protruding"
"About fourteen bombs were dropped in two series, and in no instance did they drop direct upon any building or individual"
In its first run over the town the majority of bombs fell in fields and did not explode. The second run, however, saw bombs drop in an orchard surrounding the gas works, exploding and sending shrapnel into the sides of the 'gasometers'. The latter immediately took fire, although did not themselves explode. 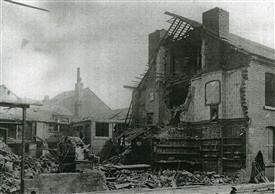 Nevertheless, the heat produced by the burning gas was instense: as The Retford Times noted, "apples [were] baked on the trees, and roosting wild birds roasted alive"
The family of the gasworks manager had a lucky escape when their house was peppered with shrapnel right into the bedrooms where, moments before, the family had been asleep. "We had not been half a minute in the cellar", said one of the daughters, "when a bomb dropped just outside the house and shattered all the windows". "apples baked on the trees, and roosting wild birds were roasted alive"
In all, three women and one man were injured in the raid - one of the former was reported subsequently as being in hospital "suffering from a lacerated brain". 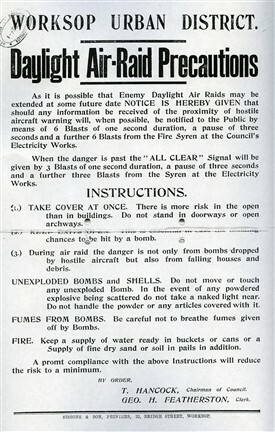 In his book Warriors For the Working Day: The Air Raids on Nottinghamshire during the Great War (1994) John Hook notes that the Zeppelin left Retford at 1.05am, dopping a further High Explosive bomb just south of Lea. 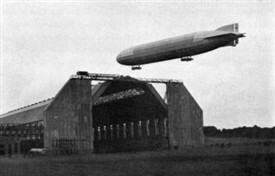 In its report of the incident, The Nottingham Daily Express (8th Sept 1916) said that the Zeppelin departed the area "at great altitude and terrific speed". This page was added by John Farjeon on 12/09/2013.